What Are They Wearing In Paris Right Now? Today’s top travel tip for fashion loving francophiles. If you are only spending one day in Paris, make sure you time your visit to coincide with Fashion Week. Somehow, via good luck and absolutely no management whatsoever, that’s exactly what I managed to do on our recent visit. Now Paris is wonderful for people watching and noting what is being worn at the best of times. But during Paris Fashion Week the entertainment value goes through the roof. However, being in Paris for such a short period of time really got me focussed. I had a lot to get done in the few hours we were there. Similarly, our tight time frame meant that I concentrated hard on the looks that were around me. While there were certainly some high fashion styles seen on the street earlier this week, I couldn’t allow myself to become (too) distracted by the more high end designs. They are perfectly fine for inspiration (especially when it comes to colour) but for the purposes of this post, I kept my attention on the stylish Parisians as they went about their everyday lives. When it comes to what are they wearing in Paris right now, here’s what I learned. While the classic trench coat still made an appearance, cropped leather jackets were easily the most favoured piece of outerwear on the Paris streets. Moto jackets were popular with all ages, as were simple zip up and open styles. The only real rule seemed be that they needed to be cropped. Black was dominant shade. Having said that, I did see three cropped red leather jackets in the space of five minutes one afternoon. The jackets were styled with everything imaginable. I saw them topping short dresses and longer line skirts. And lost count of the number of times I saw them paired with black or dark denim jeans (and I promise, I was really trying hard to keep count). I also noticed the jackets with tailored pants and pencil skirts – here they added a more casual element to more classic or formal styles. In a colour trend that seems to have continued since our last visit to Paris, the ‘dirty’ green shades of olive and khaki remain popular. These shades are a pleasant change from the blacks and greys Parisians are known for – but are still muted enough not to offend a French woman’s stylish sensibilities. I saw jeans, skirts and tops in these colours. Mostly they were paired with black or lighter denim washes. I did see one striking outfit that paired an olive skirt with a mustard coloured top. Although I wouldn’t have chosen that colour combination personally, I have to tell you that it looked fabulous on the young lady who had. Once upon a time, despite the fact that they are super comfortable for wandering around cobbled streets, no one but tourists wore sneakers or sports shoes in Paris. Especially in white. In fact, we were led to believe that they weren’t even worn in Paris for exercise! Well, that’s all changed now. I promise you they were everywhere, being worn with everything and by everyone. Ankle boots and ballet slippers tied for a very distant second. Colours ranged from black through to gold and even hot pink. Personally, I prefer the more classic colours in this space…there was more than one fabulous outfit ruined last week by garish coloured sports shoes. As an aside, I did notice more high heels wandering the streets of Saint-Germain and the Marais than I am used to seeing while I’m in Paris. It’s entirely possible that the heels were being worn by the fashionable people who’d flown in for Fashion Week – but Paris being Paris, it’s equally likely that heels could be making a comeback on the streets. I’ll be sure to check this out further next time I’m there. The trend was so obvious, even Scotty noticed this one. Large bags with handles long enough to swing onto shoulders definitely seemed to be the order of the day. Aside from the large tote bags, my awareness was captured by more saddle bags than I had seen in a very long time. They were generally in tan or cognac leather and seemed to regularly complement the olive and khaki colours that were so popular. Extra small cross body bags were less prevalent than I’ve seen in recent visits to Paris. Have you travelled to Paris recently? Did you notice any particular fashion trends? If so, I’d love for you to share your learnings in the comments section below. Looking for more French inspiration? 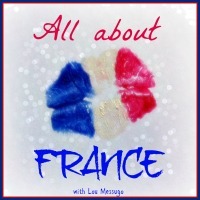 Then don’t miss the #AllAboutFrance Linkup over at the Lou Message Blog. Click this link and you’ll discover a diverse range of blog posts all about France. My daughter is all over olive green and mustard. Nobody like a French teen to be on top of trends. 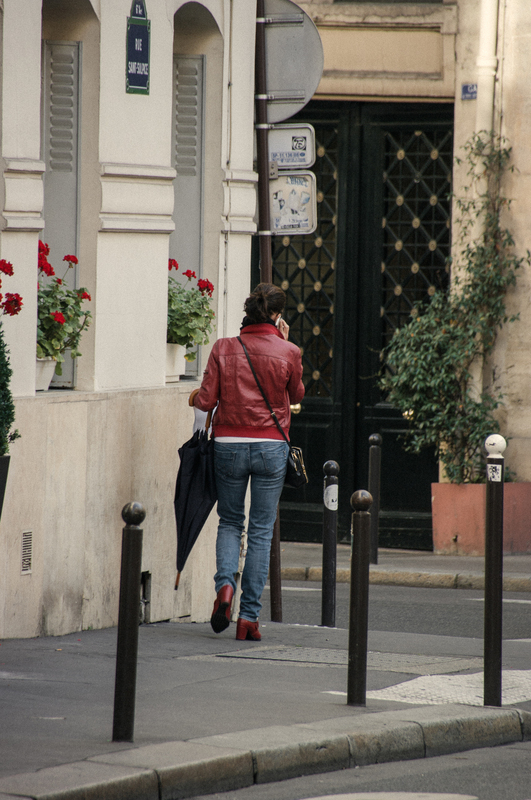 The shot of the woman in the red jacket is wonderful–her jacket with the red geraniums and her red shoes. Thanks so much for that Catherine – yes, the photo gods were smiling on me with that shot. I have to tell you that it doesn’t always work out that way!! When I think back, I must have been the worst teenager on the planet when it came to fashion and trends. I didn’t develop my eye until much later and even then it took work! Personally I think they have to be the right style of trainer Emily. I didn’t see too many of the large white styles so commonly associated with tourists. But there were lots of bright colours as well as blacks and even burgundies. Very interesting Janelle. We are going up to Paris for a weekend shortly so I’ll have to keep my eyes open. Fashion in the provinces is not the same, I need hardly add. Although I’m not a fashionista by any stretch of the imagination, I still stand out in a crowd here! Thanks Rosemary. Yes, it’s interesting. We are in Annecy at the moment and the fashions are different…yet similar at the same time. And both are a far cry from fashion in Australia. I’ll be interested in your thoughts after you’ve visited Paris next. I love that woman’s tote bag (and dog!). What fun to be in Paris for Fashion Week. Yes, it was a good look wasn’t it? And the dog was gorgeous too! But I have to admit that we fluked being in Paris for fashion week, as amazing as it was!! I have to admit I love the current trend for sneakers with everything. It makes life so simple and comfortable, I love Adidas Superstars and also a stunning pair of sneakers I just bought in pewter coloured leather. We are not in Paris but rather on the west coast close to La Rochelle, a favourite holiday spot of Parisians. Thanks Susan. I’ve been a bit slower to embrace this trend but I did catch myself gazing at a low key black pair in a shop window yesterday…..Pewter also sounds like a colour option I’d be very happy with! I returned six weeks ago from 5 weeks in Paris, and our observations are very much the same – the differences may be seasonal, since I returned before ‘la rentrée’ when styles change a bit to recognize the arrival of fall. The ‘mustard’ color, especially for tops, was very prevalent for early fall in the shops, especially for younger women, even for ballerina-styled shoes. It isn’t a flattering color for most, but as a pop of color it can be lovely, as you saw. Totes, totes, and more totes! Definitely true. I did not see as many of the Longchamp pliage totes as I saw on my last trip, though – Paris seems to have moved on from that to a certain degree, but they are still wonderfully practical and relatively prevalent. Bombers, especially leather – definitely!!! and I am still kicking myself for not buying a gorgeous lambskin bomber jacket in denim blue on sale for 99 euros – from 399! It fit perfectly and looked divine…but I just couldn’t see myself wearing it here in Virginia, and it was the end of my trip and I had already bought so much at the sales. But if I had that to do over…! Ballerinas – always and everywhere. André is the go-to shop (it is a chain, there is an André in every neighborhood) for reasonably priced and good quality ballerina flats, but Repetto has more cachet and dozens more colors (at four times the price and half the comfort, but still). They are more prevalent in summer than fall and winter, but still a French all-year basic, adorable with everything. 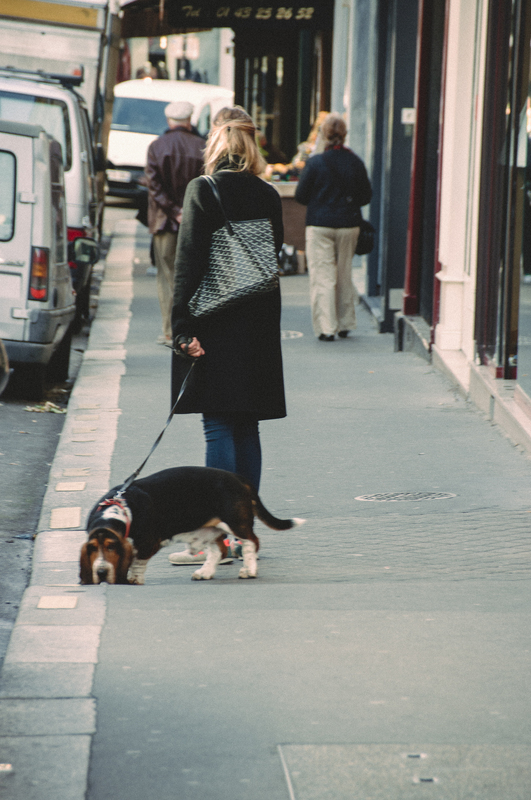 Where I am a little startled is by your mention of the trainers…yes, French women – especially younger women – definitely wear canvas shoes now, but I saw no colors except on tourists and outlying less chic areas of Paris. And what I saw were not really trainers – but more old-school low-top Converse Chuck Taylors in white and also some Adidas classic Sam Smith, also in white. Fall is likely to be bringing out the darker/colored shoes? I wore Chuck Taylors when I was there but I would suggest that a tourist not take trainers, but to arrive in Paris and see what the ‘sport shoe du jour’ is and just buy a pair there. For summer, I saw (and bought…) lots of tops with back interest, so I am expecting that this is a look that will show up in the states soon. A cute basic t-shirt with a tie at the back of the waist, a flow-y top with a tie sash at the back of the neck, a denim top with a deeply cut-out back with a wide strap that tied across the middle of the back, a linen top with a grosgrain ribbon drawstring that tied at the back of the neck (a French woman actually followed me around the shop while I looked at other things, hoping I would put down the linen top). Sorry, this got long! I was reminiscing while I was writing…and regretting that jacket! My commiserations on the jacket Alisa – there’s nothing worse than the one that got away! Yes the coloured shoe thing surprised me too…but I love your advice about purchasing shoes once you arrive in Paris – that really would save a lot of travellers angst. I’ll also be interested to see if the top trend you mentioned arrives in Australia this summer (we are heading into summer now) or if it is too soon. In the past we had to wait for things to take off in the US which sometimes left us a long way behind although this has changed in recent years. Yes, Elizabeth – Paris is a very well dressed city!! This is such a fun post! Thanks for busting the myth that sneakers are a no-no in France – it drives me crazy to hear that when of course people wear stylish sneakers all the time. But oof, I wouldn’t like to be wearing heels anywhere that I might run into cobblestones! I’m right there with you Catherine- heels and cobbles just don’t mix! You forgot scarves! Parisians love their scarves… It’s an easy way to blend into the scene just a little bit better – whether in the summer with a light cotton scarf or in the winter with a big fluffy woolen scarf. Yes, you are quite right Girl Gone Gallic – scarves never go out of style in Paris and they were everywhere! I love hearing about what the Parisians and/or tourists are wearing in Paris! I always used to watch that, too, when I had time to walk around the city. I hope the sneakers go out of style real quick! 😀 Fun to find your blog via #AllAboutFrance! Thanks Christy. Yes, I’m really in two minds about the sneakers thing. I know they are comfy but it takes the right outfit to make them look great! Great observations and nice street photography. My sister, who lived in France for many years, always told me that we in the UK follow a year behind Paris fashion, so now I feel nicely informed! I like the red leather jacket very much and I’m quite relieved that trainers are more acceptable, my sore feet are grateful. Thank you Janet. Yes, I’m very tempted by the idea of a red leather jacket too. A girlfriend had one years ago and I always loved it. I might have to keep my eyes open while I’m here!! I love your photos, the second one with touches of red is great but I prefer the look in the first one. I haven’t been to Paris for a year so it’s fun to see what Parisennes are wearing right now. Down here on the Côte d’Azur (another favourite holiday area for Parisians) we’re still in sandals and short sleeves so no leather jackets for us! I’m actually quite looking forward to pulling on ankle boots or even trainers again, though I don’t actually want the weather to change. Thanks for linking to #AllAboutFrance I hope you enjoy some of the other blogs inked up. 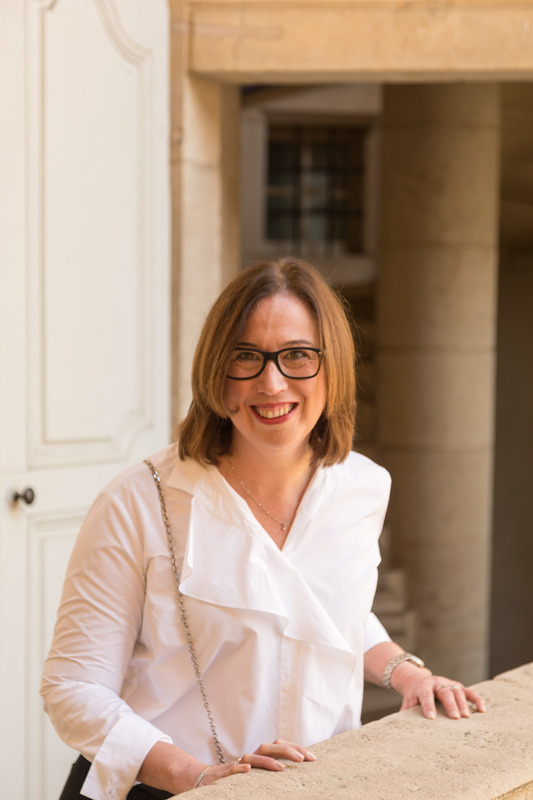 Thanks so much for hosting #AllAboutFrance Phoebe- I’m loving the other blogs that have linked up and will be keeping an eye out for number 22. I know what you mean about the weather – I’m always in 2 minds about it changing. But then I always decide to enjoy the sunshine while it lasts! Hi Janelle, I’m trying to let you know that #AllAboutFrance 22 is now on but your social media buttons aren’t working and you don’t seem to be on Twitter. Hope to see you link up again! Thanks Phoebe – yes, I’m onto it and will be linking up over the weekend! Sneakers! Gasp! Hahaha! I love the trend. Leave it to Parisians to make sneakers high fashion. Loved this 🙂 Check on all of these points, particularly that khaki green. Pingback: In the world of Save. Spend. Splurge. | Save. Spend. Splurge.